I haul a massive brick off the shelf today, but before I open it I go off on a long tangent about one of my favorite characters – Moon Knight! Then, it’s time to dig into the books – but, just half of them, since it was a seven-book stack! Episode 13 features X-Men/Steve Rogers: Escape from the Negative Zone (Amazon), Spider-Man and the Human Torch (Amazon), Astonishing X-Men: Northstar (Amazon/ Astonishing X-Men Guide), and Storm in X-Men: Worlds Apart (Amazon) – plus an introductory discussion of Moon Knight (visit the guide!). The definitive, chronological, and up-to-date guide on collecting Astonishing X-Men and Amazing X-Men comic books via omnibuses, hardcovers, and trade paperback graphic novels. A part of Crushing Krisis’s Collecting X-Men: A Definitive Guide. Last updated November 2018 with titles scheduled for release through March 2019. Astonishing X-Men launched under the unprecedented auspices of being an X-Men with the hottest possible creators that you could follow without a tangle of other comics to buy. Though that concept would be slightly watered-down over the years, the theme of a standalone, fan-pleasing X-Men book focused on relationships as much as heroics would continue to its close and into a second title, Amazing X-Men. When Astonishing launched in 2004, Grant Morrison’s massively popular run on New X-Men had just come to a somewhat abrupt halt, at least in part due to disputes behind the scenes. That lead to a line-wide re-alignment of X-Men titles, including cancelling Chris Claremont’s sideline title X-Treme X-Men and moving him back to the flagship Uncanny X-Men. Marvel had unleashed something entirely new with Morrison’s run that Claremont by definition couldn’t replicate despite his popularity with longtime readers – Morrison was an outside voice to the X-line who brought a much-needed injection of fresh ideas and a legion of new fans. Enter Joss Whedon, creator of Buffy The Vampire Slayer, Angel, and Firefly (though they’d all see cancellation by the time Astonishing kicked off). He was geek royalty with a massive fanbase, and despite having only written a handful of Buffy comics to that point, he had grown up with the X-Men. In fact, Buffy was based on Claremont’s archetype of Kitty Pryde (and Dark Willow on Phoenix)! Marvel contracted Whedon to pen 12 issues, paired with rising superstar artist John Cassaday (who was in-progress on Planetary and just off of a run on Captain America). Rather than hand Whedon and Cassaday an existing title as they had with Morrison, Marvel created an entirely new one for the pair. It was a prescient move on Marvel’s part, as when Whedon and artist John Cassaday hit delays within the first year of the book, it allowed the rest of the X-Men universe to keep moving while the pair toiled over each new issue. Marvel took the unusual step of treating Astonishing as “continuity-free” – though it acknowledges events like M-Day, it is free of crossovers and was released at a different rate than other X-books. In fact, it took four years for these 25 issues to be released – effectively putting them on a bi-monthly schedule. 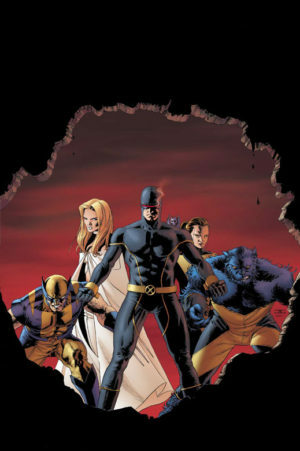 Whedon took over the concept of a more academically-minded team from Grant Morrison’s New X-Men run, with a staff of Cyclops, Emma Frost, Wolverine, Beast, and substituting Shadowcat for the recently departed Jean Grey. Dozens of Xavier Institute students are featured in the background of the early issues. With Whedon & Cassady’s run on the book over, Marvel continued the trend of using Astonishing‘s crossover-free setting to lure high-profile creators – this time landing Warren Ellis. Creator of the critically acclaimed Planetary, Ellis actually got his start on Excalibur in the mid-90s. Ellis swaps Kitty Pryde and Colossus for Storm and Armor and gives the book a speculative fiction and sci-fi theme. Afterwards the book was handed to Daniel Way and Christos Gage, Greg Pak, and finally novelist Marjorie Lui – who played up the team-as-family theme. Amazing X-Men began as Jason Aaron’s take on an X-Men away team as his run on Wolverine & The X-Men wound down, but it wound up as a single-shot story of Nightcrawler’s resurrection when he was whisked away to helm Original Sin and then launch Star Wars. Popular X-Men Academy and X-Force writer Christpher Yost wrote the majority of the remaining issues, which maintained a more light-hearted 80s feel to both the team and the stories. Note: Astonishing X-Men, Vol. 1 (1995) and Amazing X-Men, Vol. 1 (1995) were both four-issue limited series that were part of the Age of Apocalypse alternate timeline. Astonishing X-Men, Vol. 2 was a three-issue limited series that was a precursor to a major Apocalypse storyline.